Located on Dr Rajkumar Road, this lane is filled with shops that sell furniture of all sorts. Plus, they are budget-friendly and allow bargaining. It’s nothing like Central Street, but the mini furniture lane on Dr Rajkumar Road, in Rajajinagar is quite the budget haven for people living that side of the town. With roughly 10 shops making up the lane, you can get pretty much anything that you need to set up your home or even office. And that too on a budget. The lane stocks up on basic furniture with simple and functional designs for those mini pooja cabinets that come with intricate carvings and bells. Or television units ideal for a flat, with space for your fancy speakers, DVD players and perhaps an old-school record player. As much as we would like to believe the store owners when they say the furniture is made from teak and shisham, don’t go expecting high-quality wood. Most of these are made from plywood or sheet wood. Hey, budget can only get you this much. Budget-friendly doesn’t, however, stop the collection being extensive with high counter stools that come with colourful cushions and a shiny steel finish. Pretty chic! 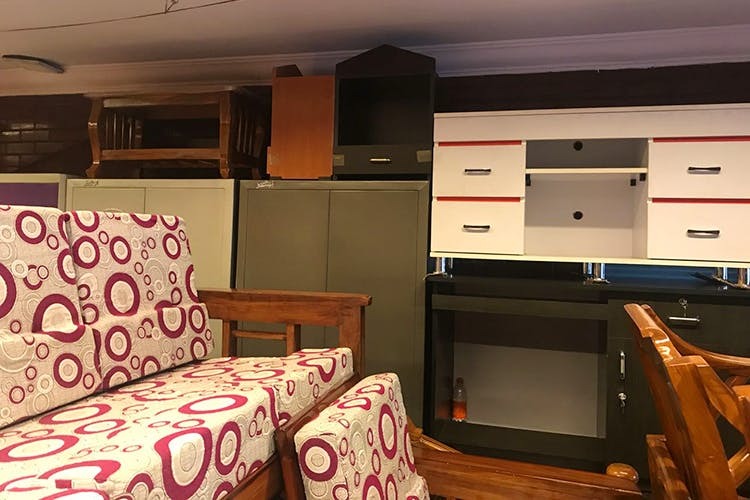 In fact, these high counter stools along with computer tables, shoe racks of all sizes and designs (open and closed), and metal and wooden wardrobes are what Anugraha Furniture specialises in. They have a bigger store just down the road that offers everything from mattresses (cotton stuffing to memory foam) and almirahs to coffee tables and TV cabinets. Let’s say you are looking to set up your 1BHK with minimal but essential furniture such as a sofa set, coffee table, dining table, shoe racks, and a wardrobe, stores such as Orchord (yes, that’s how it is spelt) Enterprises and Karnataka Furniture stocks up on plenty of those units. You can pick up faux leather sofa set for two as well as wooden ones and dining tables for two that come with wood or glass tops. Even their cupboards come in smaller sizes with three to four racks and pull-out drawers. Quite easy to transport when you are moving house. A lot of these stores offer discounts or reduce the price if you are planning on purchasing a few units at one go. At Anugraha, computer tables for INR 1,500 were offered to us for INR 1,200 and that’s considerable given how bad our bargaining skills are. Similarly, at Orchord, we were offered assurance that we can get quite a deal if we picked up a whole bunch of essential furniture.